Halliday, Hugh A.. "Fire Disasters". The Canadian Encyclopedia, 03 April 2019, Historica Canada. https://www.thecanadianencyclopedia.ca/en/article/fire-disasters. Accessed 26 April 2019. Disastrous fires may result from arson, accident or uncontrolled forest fire. Their impact may include lives lost, people evacuated and property damaged. Numerous fires, especially forest fires, occur in Canada every year; this article details the worst that have occurred throughout the country’s history. Numerous cities have had disastrous fires, particularly in the 19th century, when crowded, flammable buildings were concentrated, and before the advent of modern water mains, pumps and professional fire brigades. In St. John's, Newfoundland, three fires (on 12 February 1816, 7 November 1817 and 21 November 1817) drove 2,600 people (of a total population of 10,000) from their homes. Another fire, on 9 June 1846, levelled most of what was still a tinderbox. The city was rebuilt with more stone and firebreaks. Nevertheless, on 8–9 July 1892 a windswept blaze destroyed the city again. Québec City had two fires, on 28 May and 28 June 1845, which killed at least 23 and left 15,000–18,000 people homeless. The old walled section and Lower Town were spared, but the surviving city was smaller than that captured by James Wolfe 86 years earlier. The city was rebuilt with more stone and wider streets. However, to save money the city skimped on firefighting equipment and in 1866 reduced the size of the fire brigade. 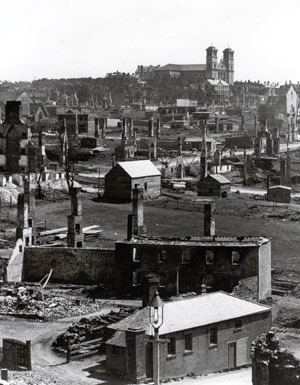 On 14 October 1866, a fire pushed by high winds took five lives, burned over 2,000 homes and left 18,000–20,000 people homeless. Again, the walled city and Lower Town were spared. 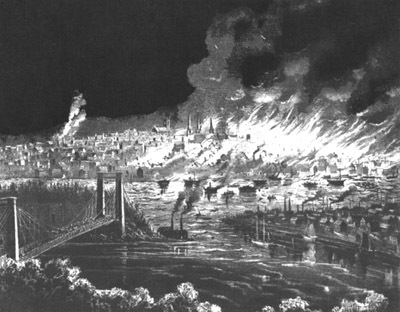 Saint John, New Brunswick, had major fires in 1837 and 1839. In spite of tighter building bylaws, a fire on 20 June 1877 destroyed two-thirds of the city, leaving 15,000 people homeless. On average, about 7,600 forest fires occur in Canada every year. While wildfire is a natural and important part of the forest ecosystem, when it encroaches on human dwellings it can have disastrous effects. Over the course of Canadian history, several major forest fires have destroyed large amounts of timber and property, and taken many lives. The Miramichi fire, which began on 5 October 1825 after a dry summer, devastated some 15,500 km2 north of New Brunswick’s Miramichi River, destroying Douglastown and Newcastle. Estimates of the death toll run from 200 to 500 people. The area's timber trade was crippled for many years, but the fire actually spurred development of logging elsewhere in British North America. Northern Ontario has been struck by several disastrous forest fires. In July 1911, for example, a wildfire struck Cochrane and the surrounding area, killing at least 73 people. A few years later, on 29 July 1916, the region again suffered from forest fire, this time in even more disastrous proportions: the Matheson fire resulted from small blazes started by lightning and locomotive sparks that combined into a firestorm. A wall of flames struck Cochrane, Matheson and environs, burning both towns and killing at least 228. While modern detection, firefighting techniques and air evacuations mean forest fires generally no longer have significant death tolls, they still wreak havoc on property and cityscapes. In the summer of 1989, for example, forest fires ravaged northern Manitoba, forcing the evacuation of about 25,000 people across 25 communities. In addition, the forest fires in 1989 were not limited to Manitoba, making it one of the worst forest fire seasons in Canadian history. The summer of 2003 was also particularly bad in terms of forest fires, with over 50,000 people being evacuated from various communities in southeastern British Columbia and southwestern Alberta. In the Kelowna, Kamloops and Cariboo regions of British Columbia in 2009, a combination of dry conditions and lightning storms led to multiple fires, the evacuation of about 20,000 people and the death of one helicopter pilot. 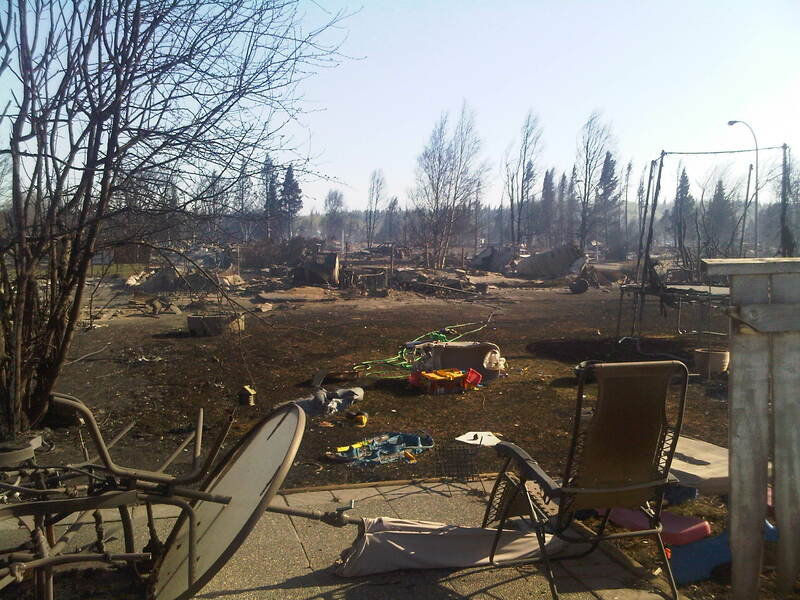 In May 2011, dry conditions and high winds led to the rapid spread of a forest fire around Slave Lake, Alberta. The 7,000-person town was evacuated; residents later returned to find one-third of their homes and businesses incinerated. The event was one of the costliest natural disasters in Canadian history, with insurable damage totalling $700 million. One firefighting helicopter pilot died following a crash into Lesser Slave Lake. 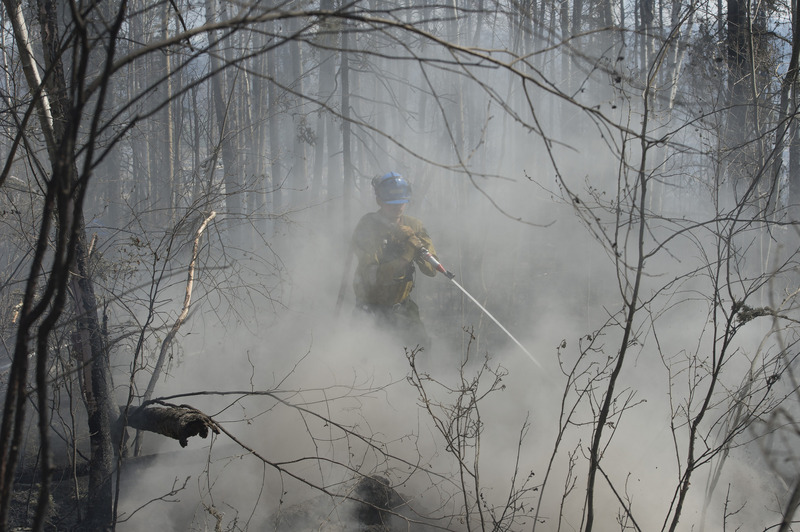 Five years later, in May 2016, another forest fire threatened a populous region of Alberta, this time around the regional municipality of Wood Buffalo, of which Fort McMurray is the largest community. At the time, temperatures in the area had reached over 30˚C, while humidity levels dropped to below 15 per cent. These dry conditions fuelled the blaze, which began southwest of the city and then jumped the Athabasca River to threaten communities on the river’s northwest shore. 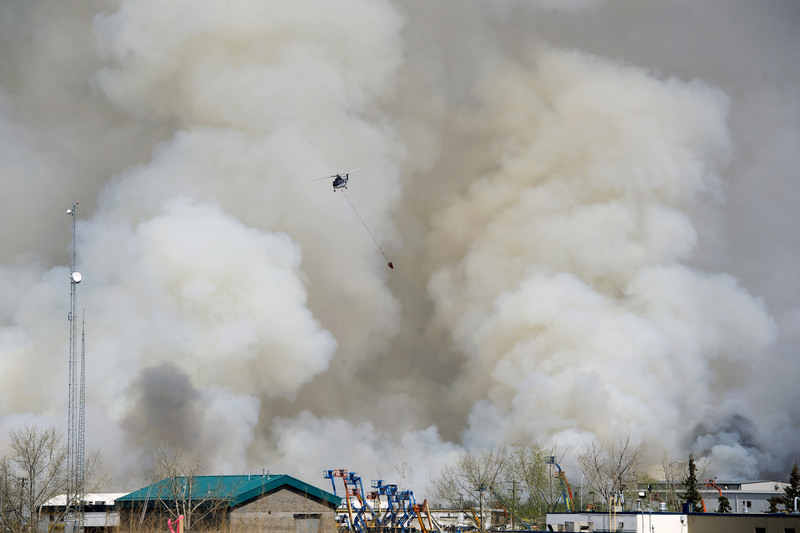 The fire eventually covered more than 500,000 hectares, forced over 80,000 residents from their homes and destroyed 2,400 structures — or about 10 per cent of Fort McMurray. It also forced oil sands producers to temporarily reduce or shut down their operations. 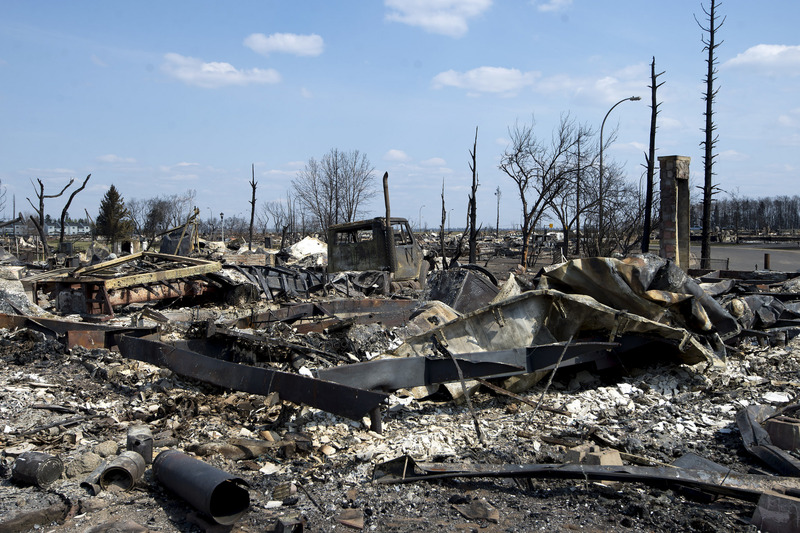 Insurance companies estimated damage from the fire would cost $3.7 billion in insured losses, making it the costliest natural disaster for insurance providers in Canadian history. A 2017 study from MacEwan University estimated that the fire’s direct and indirect costs totalled $9 billion or more. The most deadly structural fire in what is now Canada consumed the Knights of Columbus hostel in St. John's, Newfoundland, on 12 December 1942. An arsonist set fire to the building when it was packed with military personnel and their companions. The hostel was a firetrap; doors opened inward, exits were restricted and there was no emergency lighting system. Within five minutes, 99 people had been burned to death and 100 seriously injured. The main fire station was only 180 m away, but the building was doomed before the engines arrived. The burning of the cruise ship Noronic in Toronto Harbour on the night of 17 September 1949 claimed 118 lives. The blaze, apparently due to spontaneous combustion in a closet, broke out at 2:30 a.m. when passengers were asleep and fewer than 20 crewmen were aboard; it was well advanced before discovery. Contributing factors included the absence of automatic alarms, a lack of direction by officers and panic among passengers. On 9 January 1927, a small fire broke out in the Laurier Palace Theatre, Montréal. Firefighters arrived within two minutes and the blaze was extinguished in 10 minutes, but in the panic to escape an overcrowded building, many children piled up at the bases of stairways; 12 were crushed to death and 64 were asphyxiated. In addition, a deadly fire occurred at Chapais, Québec on 31 December 1979 when a man playing with a lighter in a social club set a fire that killed 44 persons. Also in Québec, on 23 January 2014, a fire broke out in a seniors’ home in L'Isle-Verte, a town of about 1,500 located on the south shore of the St. Lawrence River. Early reports suggested that the fire began after a resident was denied permission to go outside and smoke a cigarette. Of the 52 seniors living in the home at the time, 32 died. The fire ranks as one of the worst to take place in a seniors’ home in Canadian history. Another fire in Québec seniors’ home, in 1969 in Notre-Dame-du-Lac, had 54 fatalities. Destruction by fire of Knights of Columbus Hostel, St. John'sA digitized copy of a report on the 1942 fire that destroyed the Knights of Columbus Hostel in St. John's with the loss of 99 lives. From the Memorial University of Newfoundland Digital Archives. Canadian Disaster DatabaseClick on the locations in the chart for details of wildfire events (evacuations, work disruptions, firefighting resources, costs) in Canada. From Public Safety Canada. The international nature of the Miramichi FireA brief abstract of a paper that explores the impact of the horrendous 1825 Miramichi fire from The Forestry Chronicle. Historicist: Queen of the Great Lakes AflameAn article about the 1949 fire aboard the SS Noronic that cost 199 lives, the worst disaster in Toronto's history. With photographs. From torontoist.com. 10 years later: Remembering the Okanagan Mountain Park fireA Global News story that covers the devastating 2003 Okanagan Mountain Park fire and shows measures that have been taken since to try to prevent a recurrence of such events in that region of British Columbia. ‘Lest we forget’: Canada’s major wildland fire disasters of the past, 1825-1938A well-illustrated paper that provides an overview of nine of the most devastating Canadian wildland fire disasters in the distant past. From the FireSmart Canada website. Quebec City Fire, May 28, 1845View a painting and brief description of the fire which destroyed a section of Quebec City Fire on May 28, 1845. Click on the icons above the image for a larger view. From the McCord Museum. Battling wildfires in AlbertaA Global TV news story about strategies employed to fight forest fires in Alberta.